The Last Minute Gift Guide For The Social Santa — truly. We know what it’s like; you planned to have your Christmas shopping done and dusted by late November. However, life got in the way. The dog got sick, the boiler broke down, and now you’re stuck for gift ideas with Christmas breathing down your neck. Don’t panic! Truly Social is here to save your Christmas cheer. We’ve had our little social elves scour the workshop for this gift ideas list… you're welcome. As one of Truly Social’s bibles, we can’t recommend Jonah Berger’s Contagious enough. But don’t take our word for it. This book is a New York Times bestseller and was named Best Marketing Book of 2014 by the American Marketing Association. This fantastic read lays down principles of virality based on Berger’s extensive research. For the person who just doesn't know how to "holiday". For taking those sneaky pictures of Grandpa when he inevitably falls asleep after too much turkey, the Gorillapod is now available in King size. With it’s flexible arms, the Gorillapod can wrap around virtually any object or surface. This is Tara’s pick for travel vloggers, or really anyone who can’t be bothered to lug around a clunky tripod. The best part is this photo hero fits in any small bag (no luggage weight worries)! This Christmas, give the gift of life… for your electronic devices, that is. This handy TP-LINK 15,600mAh Power Bank comes with 2 USB ports and provides protection against short circuits, overcharging, and overheating. Plus, it’s a white as snow!❄️ Everyone at TSI keeps one around for those days when an outlet just can’t be found. A little bit of an evil laugh will be heard when all the plugs are full and they'll be able to keep a full charge. In case the Grinch decides to steal Christmas again. With its magnetic stand and 24/7 live streaming abilities, you can keep your Christmas stockings safe with this handy little security system. We love the Nest Cam so much, we’ve got a couple in our office - adorably disguised in Minion form. What could be a better gift that eternally free entertainment. atching the cams can be addictive fun. 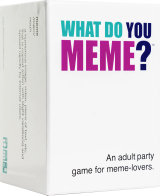 Test your meme knowledge with the hilarious card game created by meme king f*ckjerry. Plus, this game (probably) won’t end in violence like a family game of Monopoly does. The aim is simple: match the caption cards to the meme. Us, trying to decipher the cryptic meme questions. Stylish and cosy are an essential for touchscreen gloves - the TSI team would be out of commission on our commutes if it wasn’t for them. They were also featured in one of our favourite publications, Techcrunch, so these handy (see what we did there?✋) gloves make for a fantastic last minute stocking-filler for that person on your list who is always going to “Do it for the ‘Gram”. The holidays present way too many photo ops to miss just because it's -10 outside! Speaking of phones, what kind of list would this be if we didn’t include the brand new iPhone X? Tara took the leap and acquired this wonderful device and her Instagram has never looked more on point! Super sleek, super durable, and super packed will all of the latest technology you’d expect from an Apple device - this one is for that special photographer in your life. Just make sure they look up from the screen at least occassionally! Another gift idea inspired by the Truly Social office. What can we say? We have great taste. We love to leave messages on this USB powered light box. This is perfect for that family who leaves cute little messages for each other around the house. It's great to have at parties, weddings, and photo shoots for that on-location snap. Bring a little light into your life . We use this one a lot! It's so nice to come back to the office to a nice message from the team. Sometimes sparkly clothes just isn't enough glitter, you know? Add some colour to a living room or bedroom with these super cute emoji pillows. We’re planning on upgrading to these when we restructure our office space. With all of your favourite emoji faces and logos, you can kiss goodbye to those horrible paisley pillows your mom bought you in 1994. But be quick, these comfy little items are selling out fast! We all know that person who would rather respond in emojis than try to describe their feelings. We wish the best of luck shopping to our fellow social Santas. Let us know what you think of our list - and let us know about some of faves on Twitter. Don't forget to catch up on #YourDailyDistraction for more social gifting inspiration year-round. Have a wonderful Holiday Season from all of us here at Truly Social!